With over seven miles of pristine beaches, the urge to return to Hollywood year after year is undeniable. We’re not talking about snow birds, we’re talking about sea turtles! Sea Turtle Nesting Season begins on March 1st and continues through October 31. Residents and beachgoers are urged to be aware while visiting Hollywood Beach during the evening hours. If you are on the beach at night and you see a large turtle coming ashore, watch from a distance and avoid the urge to get closer. Threatened and endangered sea turtle mothers come ashore mostly at night to deposit their egg clutches and then they return to sea. Loggerhead turtles (Caretta caretta), a threatened species, may lay four to five nests per turtle per season, with each nest containing an average of 110 eggs. In 2013, there were 2,459 loggerhead nests deposited on Broward's beaches. Two endangered species of sea turtles also nest here, but less frequently than the loggerhead. In 2013, green sea turtles (Chelonia mydas) deposited a record 495 nests, and leatherbacks (Dermochelys coriacea) deposited 18 nests. 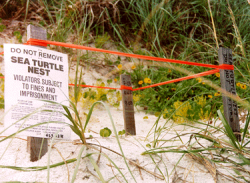 Hollywood’s North Beach is a designated sea turtle hatchery. A preserve has been developed to protect our special visitors. Members of the public wishing to participate in organized tours to witness the nesting ritual can contact the Broward County Sea Turtle Conservation Program at 954.519.1255 for information. In addition to state and federal laws protecting sea turtles, the City also has strong Ordinances on the books. After a short incubation period, hatchlings will leave the nest with their instinct to head in the direction of the brightest horizon. On our beaches, under natural conditions, this would be east toward the ocean due to the dark silhouettes of dunes and a starlit illuminated ocean. However, artificial lights toward the west can confuse hatchlings and cause them to search for the ocean in the wrong direction. Hollywood beachfront homeowners, businesses, hotels and condominiums are required to turn off or shield their lights from the beach during the sea turtle season. If members of the public see hatchling turtles heading in the wrong direction they should call the sea turtle emergency response cell phone at 954.328.0580. View the March 4, 2015 update presentation here. View the Sea Turtle Lighting Guidelines here.